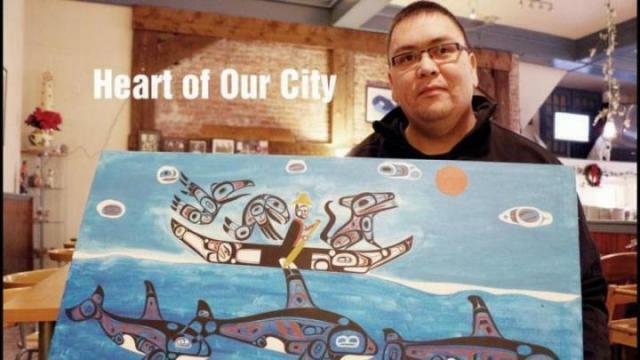 Todd Stephens is a Nisga’a artist who grew up in Prince Rupert. In each of his pieces, he often incorporates his own human element. Amidst the chaos of the Kaien Island craft fair, the Nisga’a artist towered over the other vendors with only a folder of his prints on the table. As shoppers browsed through soaps, knits and pottery, Todd Stephens offered indigenous work— the u-shape curves and ovoids of the eagle, raven, wolf and his own crest, the killer whale. As a boy, he would often visit with family in Greenville, or Laxgalts’ap, where he would watch his uncle draw and paint. One day, his uncle was transferring a design from a sketchbook to artist-quality paper and Stephens asked if he would teach him to be an artist. “Just draw,” his uncle replied. “I was a little disappointed to hear that, but those two words started something for me,” Stephens said. That was 14 years ago. He started drawing and in 2007, he enrolled in the Freda Diesing School of Northwest Coast Art at the Northwest Community College in Terrace. At the craft fair, inside the gymnasium of the Jim Ciccone Centre, Stephens showed me his artwork before his training and after. Most of his lines were basic, solid. “In the first six weeks in the first year was nothing but drawing ovoids,” he said with a laugh. Now, his ovoids bring character to the eye of his killer whale or wolf. Inspiration, he said, comes from his culture, his personal and his community’s collective history. His mother had a rough upbringing surrounded by substance and sexual abuse. She left the Nass Valley for Prince Rupert when Stephens was only two months old. “She grew up with that, and in her mind she didn’t want that for her kids, so she decided to move to Rupert,” Stephens said. Despite leaving their culturally rich community for the coastal city, his mother would make a point to bring them back to their roots every break they had from school or she had from work. Returning to his grandparents allowed Stephens to ask his grandmother cultural questions and to learn art from his uncle. At 19-years-old, his plans to be an artist shifted when he received a text from his then-girlfriend that she was pregnant. “I was scared. But she was born and all of that, I was surprised I even had those thoughts. When she’s in my arms that was that,” Stephens said about his first daughter Georgia, who is now almost nine-years-old. They married and moved to Terrace for college after Georgia was born. Stephens upgraded his education in preparation for a business administration course. He said, he often swayed between a career that he thought would provide for his family, and being an artist. At first, he leaned toward art and enrolled in the Freda Diesing School. In the first year, he was selected for the YVR Art Foundation scholarship. He was flown down to Vancouver’s international airport for the award, and then he embarked on a year-long project under a mentorship from an instructor at the college. He carved a hummingbird headdress made of alder, with pieces of abalone and a mane of horsehair that went on display at the airport for one year before moving to the fine art Spirit Wrestler Gallery. The piece sold immediately. The Prince of the Killerwhales, a self-portrait mask, was the second item he sold through the gallery. Despite his success, he hasn’t carved in four years. “I had the wrong way of thinking. When I had my kids I thought I’ve got to get a job, I have to feed my family,” said the 28-year-old. Five years later, Mya-Lee was born and then Tianna.The father of three took the carpentry foundations course, originally to grow his art career to learn how to use the tools, but also to build cabinets and his resume. In 2013, he worked on the Kitimat Modernization Project to expand the Kitimat Works aluminum smelter but he was laid off the year after. The young family moved to Prince Rupert for more accessible childcare. Stephens took advantage of the North Pacific Cannery program to apprentice as a carpenter. From January until October he worked on re-building the working dock out on the Skeena River. Afterward, he picked a couple short-lived gigs but the opportunities dried up. Now, he’s working for Thompson Community Services helping disabled residents. Recently separated from his wife, and carving out his path on his own, Stephens is staying close to his daughters. He plans to dive deeper into the art scene from the craft fair on Kaien Island all the way down to Seattle.